Professor Lawrence E. Stager of Harvard writes about the discovery of the silver calf at Ashkelon in the summer of 1990. In the waning days of the season, on the outskirts of the Canaanite city, we excavated an exquisitely crafted statuette of a silver calf, a religious icon associated with the worship of El or Baal in Canaan and, later, with the Israelite God, Yahweh. The calf lay buried in the debris on the ancient rampart that had protected the city in the Middle Bronze Age (c. 2000–1550 B.C.). (BAR 17:02 (March/April 1991), ed. Hershel Shanks (Biblical Archaeology Society, 1991). In Life in Biblical Israel, by King and Stager, the calf is dated “around 1600 B.C.E. (p. 173). 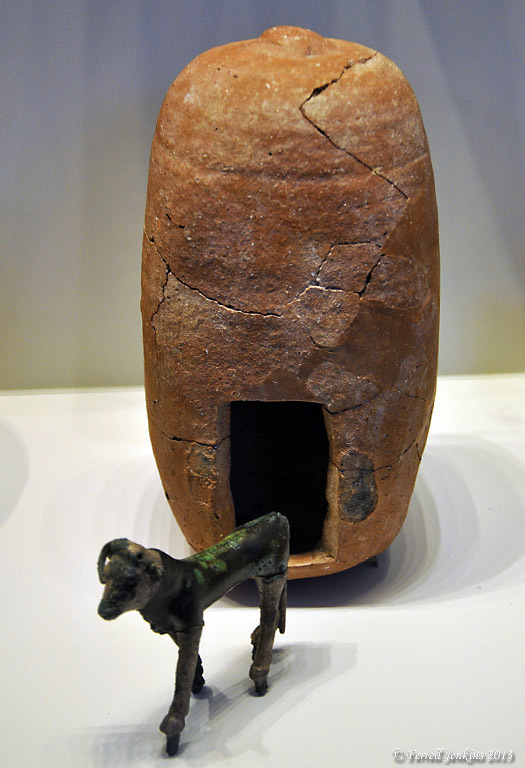 This bull calf and the pottery shrine in which it was found is now in the Israel Museum in Jerusalem. Bronze and silver calf and sanctuary found at Ashkelon. Photo by Ferrell Jenkins. Bible students recall the golden calf made by Aaron at Mount Sinai (Exodus 32:4). We also know about the golden calves erected by Jeroboam I at Dan and Bethel (1 Kings 12:28-30). In the prophet Hosea we find references to calves in Samaria (8:5-6) and Beth-aven (10:5). Stager calls attention to a significant reference in Hosea 13:1. The discoveries of archaeology often shed light on biblical accounts and help us to see the reality of them. For a photo of a bull from the Samaria region, see here. This entry was posted in Archaeology, Bible Places, Bible Study, Israel, Old Testament, Photography, Travel and tagged Israel Museum. Bookmark the permalink. Jo, the little silver calf is less than 4.5 inches long, and 4 inches high. I also wonder about the size of the ones erected by Jeroboam. I wonder how large this was, and I’ve often wondered how large the golden calfs were that they made for woship in Dan and Bethel ? It always amazes me that they find artifacts that date back to major Biblical events like the Exodus. Thanks for sharing.